C and P Security provides a wide range of security grilles and gates which are manufactured to a high standard, using round or square steel bars of various thicknesses. These can be formed to suit varying applications such as; Window grilles, door protection grilles, and bespoke designed grilles. All of our grilles can be made to fit any installation situation for example; reveal fix, face fix and stand offs for protruding window vents. Whatever your window or door requirements may be, we can manufacture a grille that will not only look good but will protect your property against a break in. The grille below is just one design variation that can manufactured. This particular window has a top vent that opens outwards, hence, we have bowed the grille outwards. There is limited space to install the grille within the reveal, so face fix brackets have been included. The space at the top sides have been filled with scrolls for extra security and design. This particular grille has very individual design features which is simple and effective . The grille above is a basic window grille with 16 mm vertical bars. The horizontal bars are pin fixed into the masonry and 4 simple scrolls have been added for decorative effect. 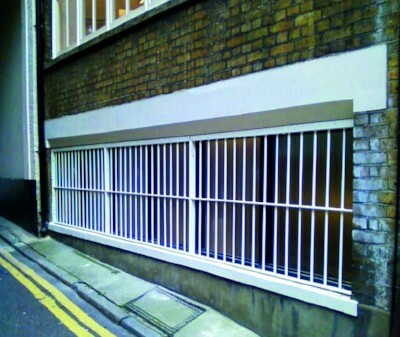 This type of grille is very popular for external basements or vulnerable ground floor windows. These are simple, economic and cost effective. 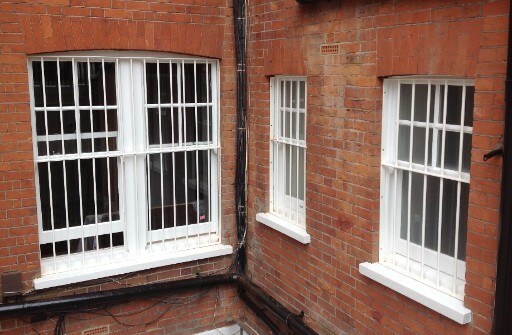 Escape hatches or hinges can be incorporated within our grilles for easy window maintenance.